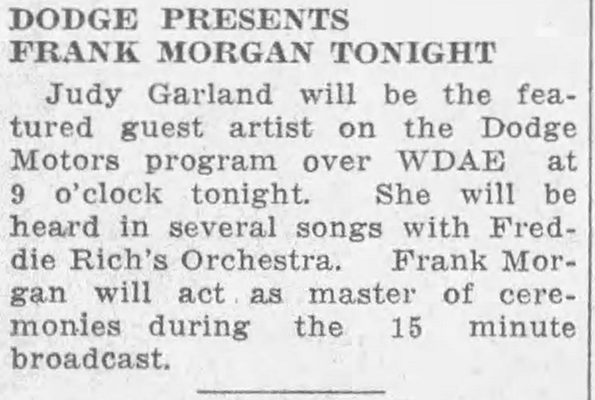 August 9, 1937: Judy’s eleventh (and final) appearance on Frank Morgan’s limited series of 15-minute shows. Little is known about these shows outside of what the newspapers tell us, which do not include the actual contents, just schedule listings. No recordings are known to survive. 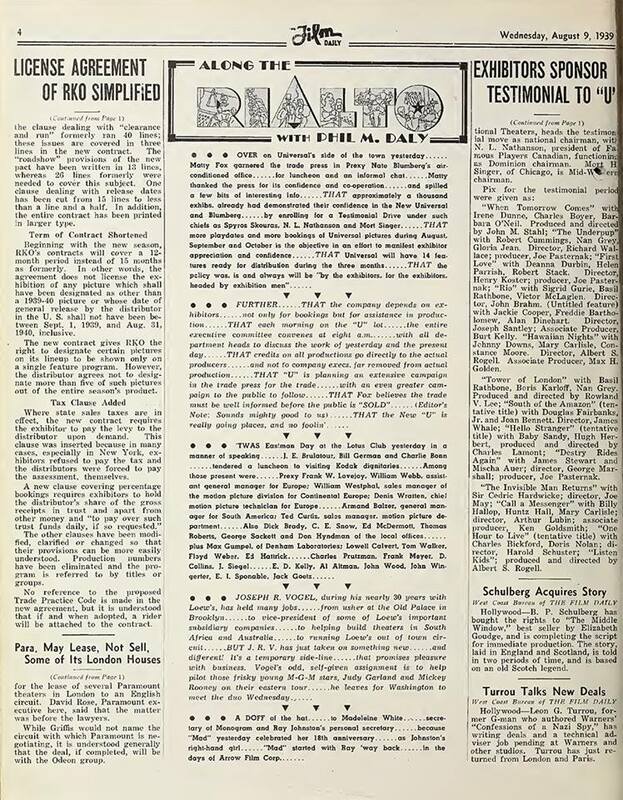 Included above is a notice from the Los Angeles Times promoting the upcoming release of Broadway Melody of 1938. 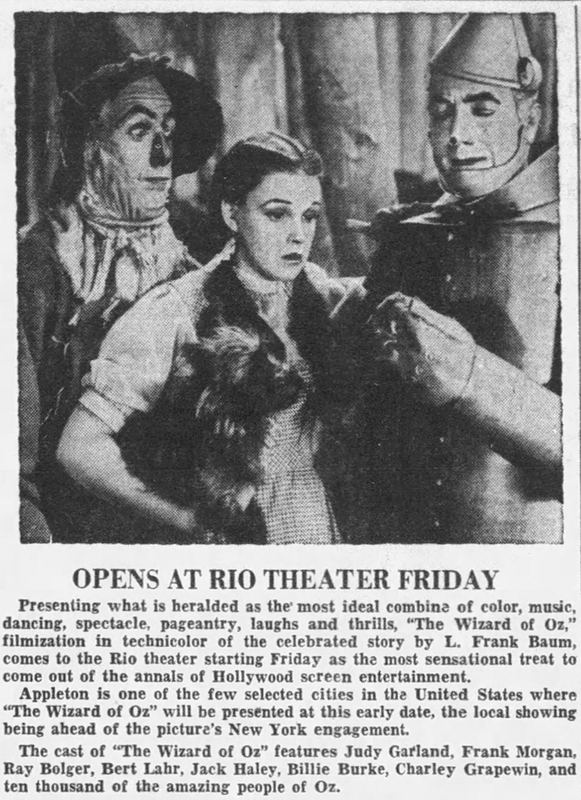 August 9, 1939: This short blurb in the “Film Daily” trade paper (part of Phil M. Daly’s “Along the Rialto” column) is the first of several notices that chronicle the lead up to the premiere of The Wizard of Oz at the Capitol Theater in New York, as well as chronicling Judy and Mickey’s east coast tour that also led up to the premiere. JOSEPH R. VOGEL, during his nearly 30 years with Loew’s, has held many jobs ….. from usher at the Old Palace in Brooklyn ….. to vice-president of some of Loew’s important subsidiary companies ….. to helping build theaters in South Africa and Australia ….. to running Loew’s out of town circuit ….. BUT L.R.V. has just taken on something new ….. and different! It’s a temporary side-line ….. that promises pleasure with business. 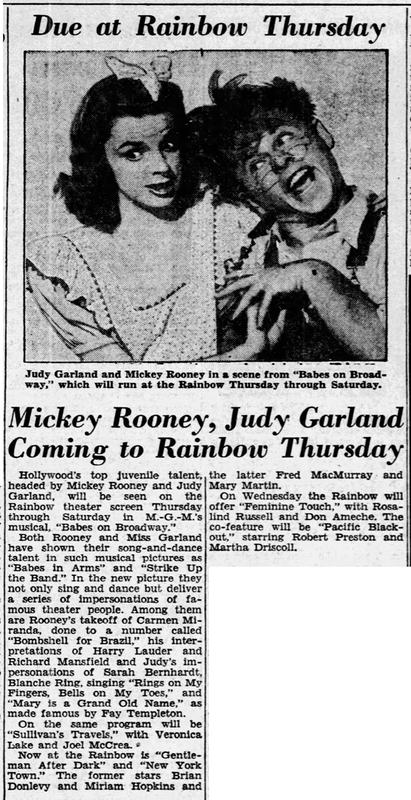 Vogel’s odd, self-given assignment is to help pilot those frisky young M-G-M stars, Judy Garland and Mickey Rooney on their eastern tour ….. he leaves for Washington to meet the duo on Wednesday. 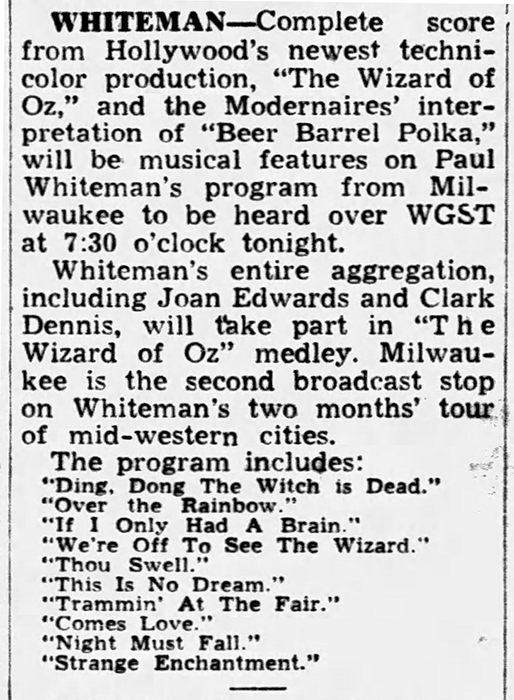 Above, some more Oz-related newspaper items, including a radio broadcast with Paul Whiteman and his orchestra playing the score of The Wizard of Oz; a boy scout from Wilmington, Deleware, was sent to be one of the guests at Judy and Mickey Rooney’s appearance at the Capitol Theater in Washington, D.C. (which took place on this date); Loew’s (MGM’s parent company) selected 300 youths to participate in the festivities of Judy and Mickey’s visit to New York and their appearing on stage between showings of the film after it opened on August 17th at the Capitol Theater. 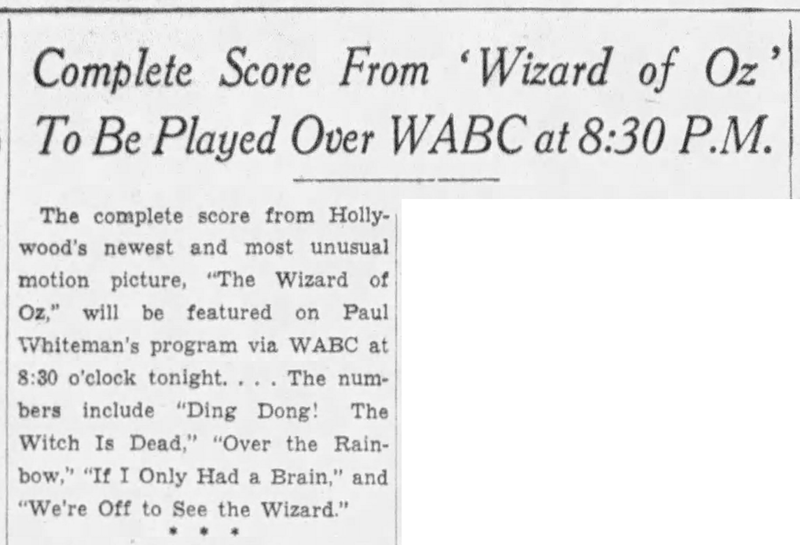 Paul Harrison’s column was mostly about The Wizard of Oz and included the often quoted statement by L. Frank Baum’s widow, Maude Baum, “Oh, I suppose there’ll be a Wizard in it…” Harrison doesn’t get his facts correct as to some of the details about the effects in the film, but he probably was given the info from the MGM Publicity Department and what they put out was usually quite fabricated. In spite of her well-founded cynicism, Mrs. Baum is due for a surprise. Sic or eight months ago, Hollywood didn’t expect very much of the picture, either, because double-trouble had been encountered at every turn in trying to bring fantasy into reality, and living players into fairy-tale creatures, and scores of film tricks into Technicolor. There were false starts and heated conferences and a general tearing of hair on the part of technicians. Actors sweated, swore and suffered in grotesque makeups which were discarded, time after time, following tests. Songs were written, rehearsed, shot and thrown out. The story was jiggled around to add adult appeal and juggled back to please the kids. Distraught business executives watched costs mount until it was clear that the production, good or bad, was going to set back Metro at least $2,500,000. And then, almost suddenly, the troubles cleared away like a movie mist whipped by wind machines. Makeups were perfected which did not obscure the personalities of the players. Technicians solved most of their problems in magic. And the story was brought into focus by putting all the Oz adventures into a dream by Dorothy after she had been bopped on the head during the cyclone. 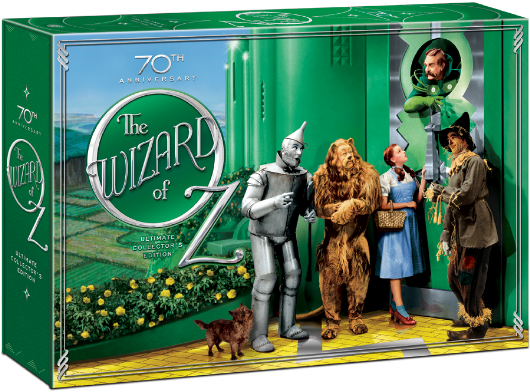 The principal Oz characters resemble people she knew in Kansas; a mean neighbor woman becomes the Wicked Witch, a medicine show faker, the Wizard, farm hands, the Woodman, Scarecrow and Cowardly Lion. The only compromise with color difficulties is that the initial sequences in Kansas are in monotone. This was done because it simply wasn’t possible to make process shots in color of houses, people and animals being blowed through the air in the required comic attitudes. But the later change to full color works out very well because it heightens the fairyland effect. The tricks in Oz mostly were accomplished by elaborate mechanical and electrical devices, such as the awesome hocus-pocus in the Wizard’s throne room with lightning flashes, colored smoke, sheets of flame, and an unearthly voice booming from nowhere. Wizard Frank Morgan spoke with a perfectly natural voice into a microphone, but before it emerged from hidden loudspeakers it has been deepened, enormously amplified and distorted by being bounced through a quarter-mile tunnel which runs under the studio. Midgets from all over the country, about a hundred of them, became citizens of Munchkinland, and some were Winged Monkeys. Their natural voices were lowered to bass tones from recordings in the sound laboratory. The songs of birds in Oz are merely the notes of ordinary birds on soundtracks which were run backward. The Winged Monkeys fly on wires when they must. And the Wicked Witch, vanquished when Dorothy douses her with water, “dissolves” through a trap door in the stage. All such stunts would have been simple with the masked double exposures and rear-projection backgrounds of the black-and-white screen, but studio experts couldn’t even fake a rainbow for the characters to walk on. They finally had to build one. Only instance of successful double exposure is a bubble that comes bouncing along over Munchkinland, changing color and growing larger until finally, it stops and out steps Billie Burke, the good Queen of the South. This was done by photographing a dangling, jet-black ball and then, on the color negative, hand-tinting the white circle that resulted. 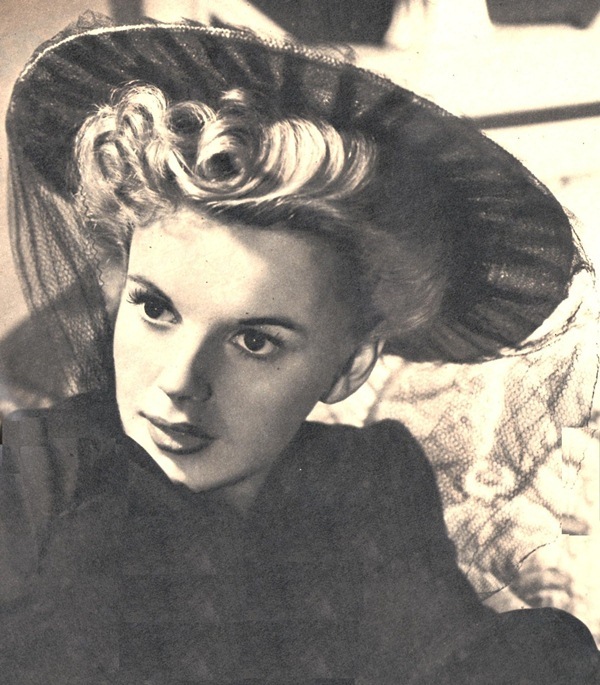 August 9, 1940: Judy pre-recorded “It’s A Great Day For The Irish” for Little Nellie Kelly. The song became one of her most popular. She even recorded a stereo version 20 years later, almost to the day of this pre-recordings, on August 8, 1960, as part of her “London Session” recordings. 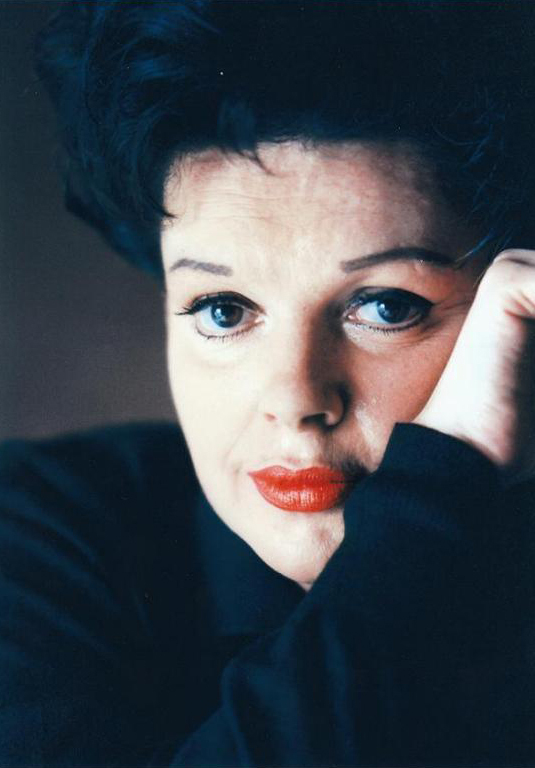 Later in 1940, on December 18th, Judy recorded her first studio version of the song for Decca Records. 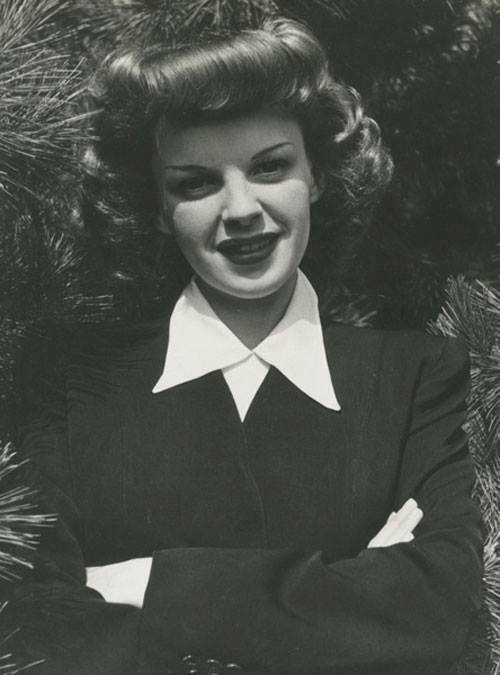 Also on this day in 1940, Judy had a wardrobe fitting for Little Nellie Kelly. 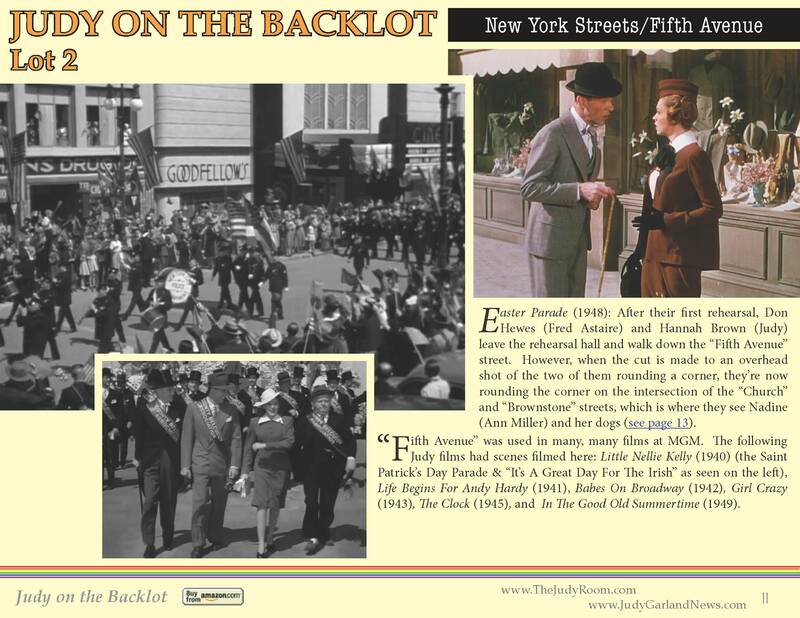 Time called: 11:30 a.m.; dismissed: 3:30 p.m.
Judy filmed “It’s A Great Day For The Irish” just a few weeks later on MGM’s Lot 2 in their “New York Streets” section. On this day, Judy was filming more of the “Ghost Theater” sequence for Babes on Broadway on the “Interior Old Duchess-Backstage” set. Time called: 9 a.m.; lunch: 12:40-1:40 p.m.; time dismissed: 4:15 p.m.
August 9, 1942: Babes on Broadway was still playing. Also, according to the second article, Judy was just learning how to read music. August 9, 1943: Louella Parsons reported that Judy had a “whale of an idea” for a new stage musical. 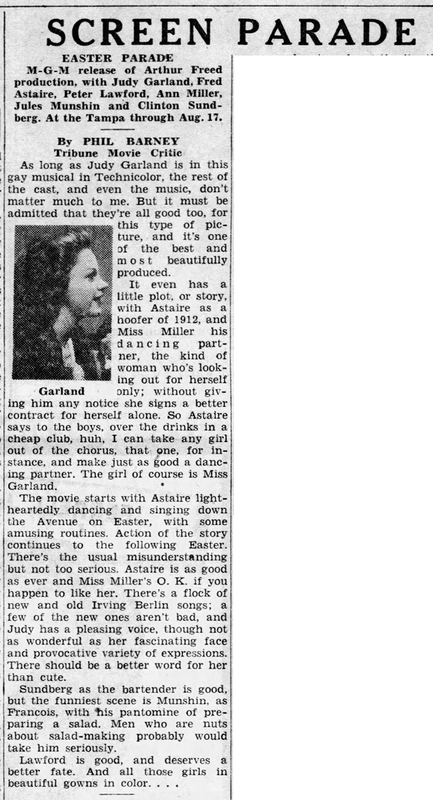 Judy Garland has a whale of an idea which she has submitted to Louis B. Mayer with the hope that he will okay it. 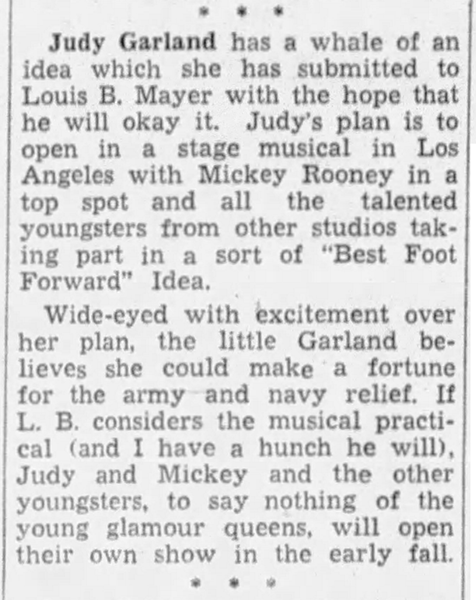 Judy’s plan is to open in a stage musical in Los Angeles with Mickey Rooney in a top spot and all the talented youngers from other studios taking part in a sort of “Best Foot Forward” idea. Wide-eyed with excitement over her plan, the little Garland believes she could make a fortune for the army and navy relief. If L.B. 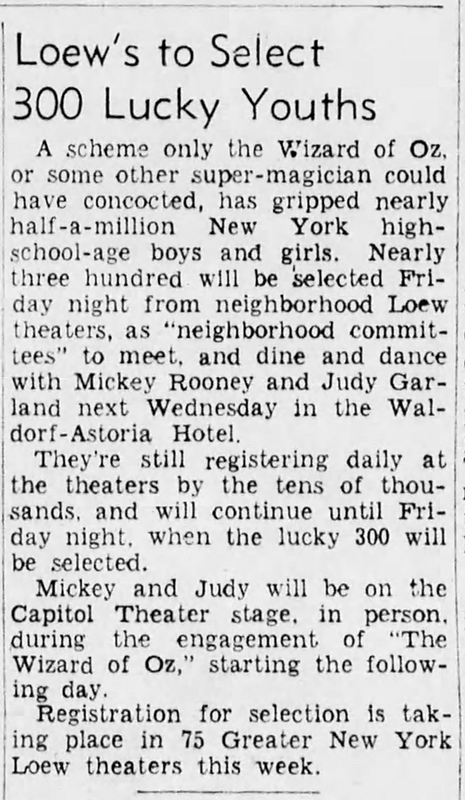 considers the musical practical (and I have a hunch he will), Judy and Mickey and the other youngsters, to say nothing of the young glamour queens, will open their own show in the early fall. 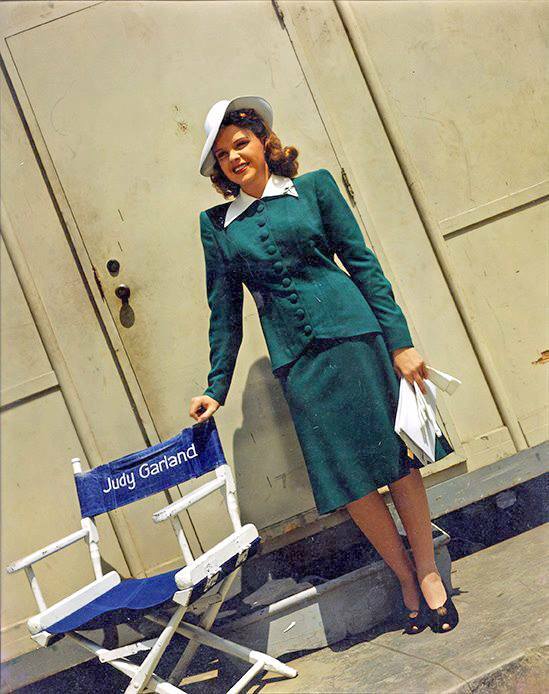 August 9, 1944: Filming on The Clock was canceled on this day due to Judy being out sick. 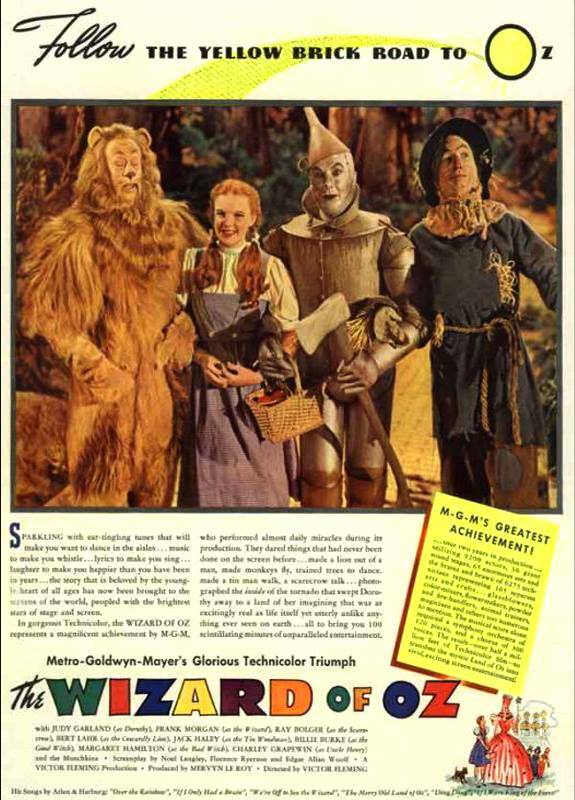 The ad for the film at the right is unusual in that it uses a photo of Judy from the 1946 film Till The Clouds Roll By. 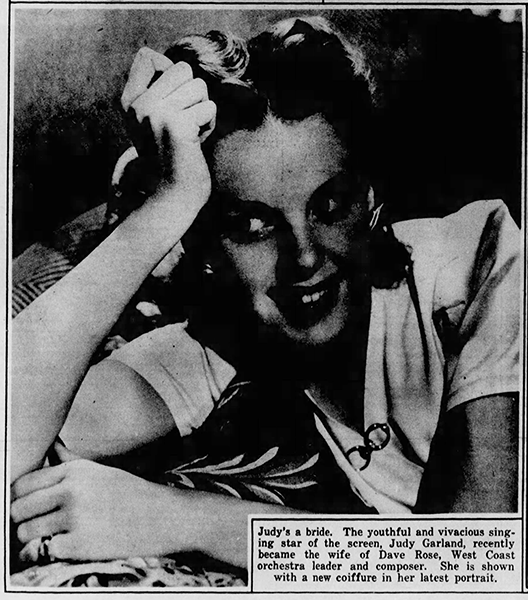 Below, a news blurb that claims Judy wore one of the costumes from the film to her “recent” birthday party. 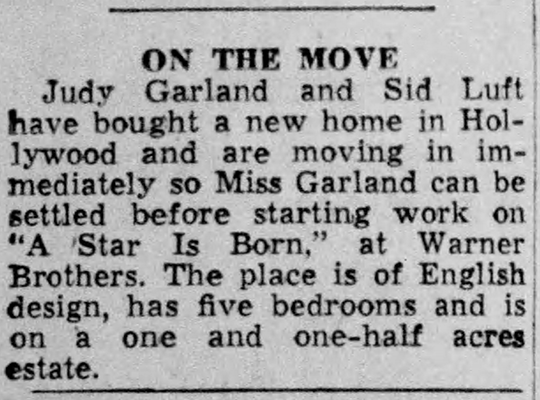 August 9, 1953: Judy and family recently purchased a home in the Holmby Hills section of Los Angeles where they would live until the early 1960s. The property was previously owned by film producer Hunt Stromberg. 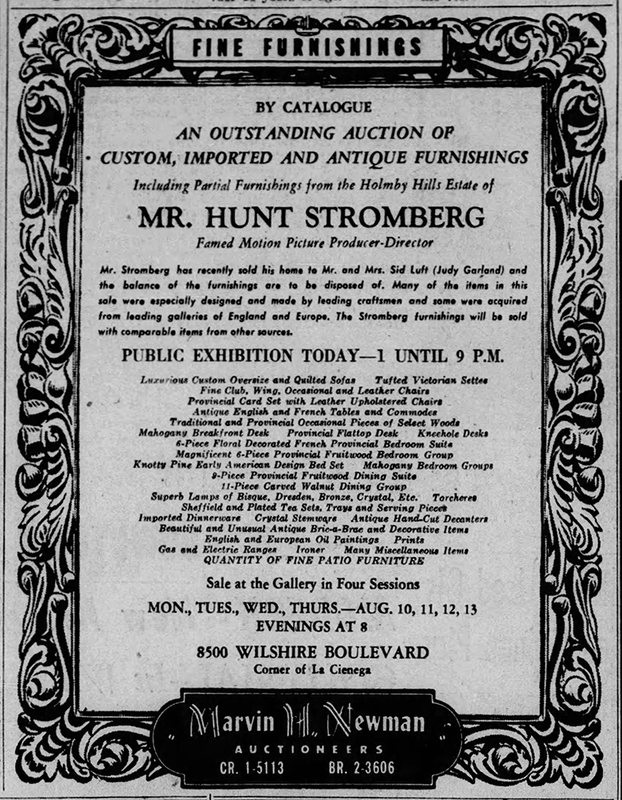 According to the auction notice above, Stromberg left furnishings and other items that went up for auction beginning August 10th, with a public exhibition held on this date not at the home but at the auction house. There are some interesting items in the list. 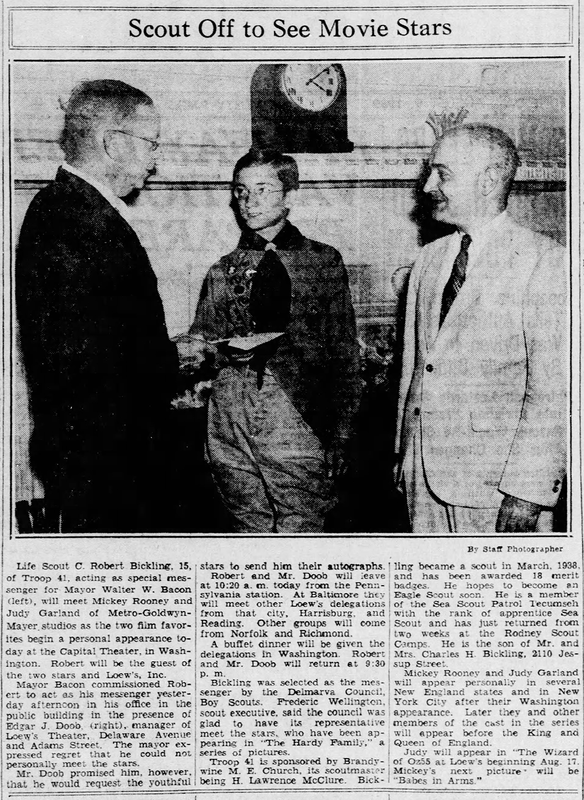 Stromberg wasn’t in financial need by any means, having been a successful film producer and a founding investor in Santa Anita Park and Hollywood Park Racetracks. These were simply items he didn’t want anymore. I wonder if Judy and family got first dibs on any of it as part of the sale? 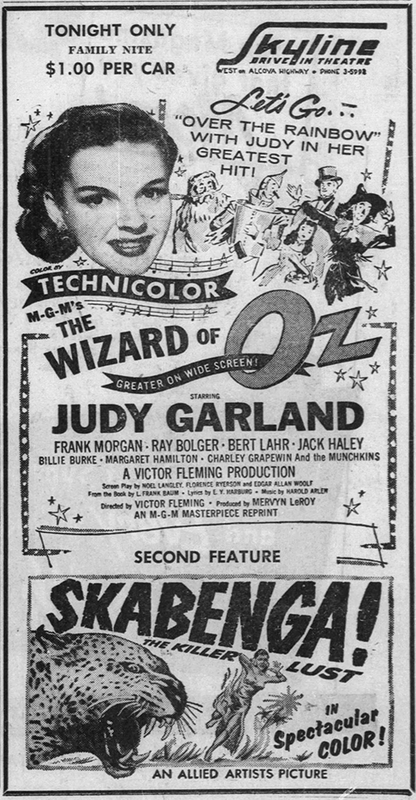 August 9, 1956: The 1955 re-release of The Wizard of Oz was over but that didn’t mean the film wasn’t still circulating, as this article and ad from the Casper, Wyoming “Morning” paper show. The film had its world television premiere that following November 1956, which turned out to be a milestone in the films and television history. August 9, 1961: Judy signed a contract drafted on this date for her September 20 concert in Denver. Her payment was $12,500; she would also receive 60% of the box office take once it got over $25,000. August 9, 1968: Judy appeared on The Mike Douglas Show, videotaped in color at the TWY-TV Studios, Channel 3, in Philadelphia, Pennsylvania. 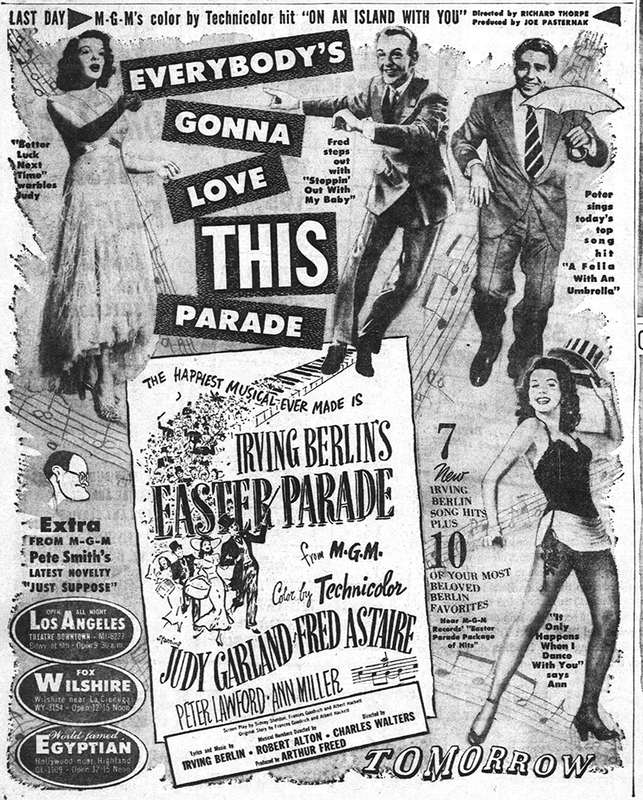 The show was co-hosted by Judy’s old friend (and Easter Parade co-star) Peter Lawford. Judy and Peter reminisced about making Easter Parade, including the funny story of Judy’s red feather during the “A Fella With An Umbrella” number and how the red dye from the feather “bled” all over her face. 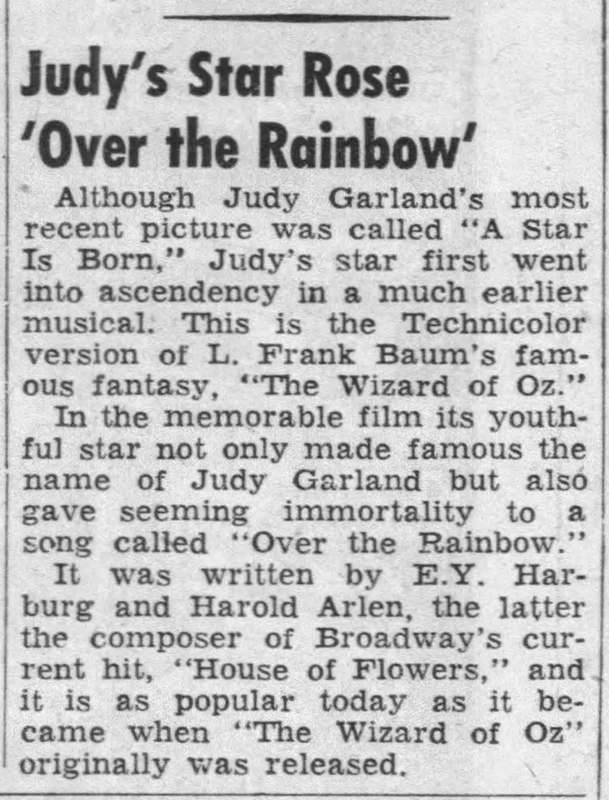 Judy was in great form vocally, singing “For Once In My Life”; “How Insensitive”; and “Over the Rainbow.” The latter was the third, and final time she sang the song on TV. The show aired on August 16, 1968, but since it was a syndicated show, it also aired in Philadelphia a few days prior on August 12th. Below is a video of Judy’s segment. According to Scott Schechter’s book “The Day-by-Day Chronicle of a Legend,” the original videotape “is rumored to be sitting in the apartment of a long-time fan, where it is certain to be deteriorating as it is not being stored in a proper facility meant to house videotape masters.” I don’t know if this is still the case, but the video below looks pretty good! 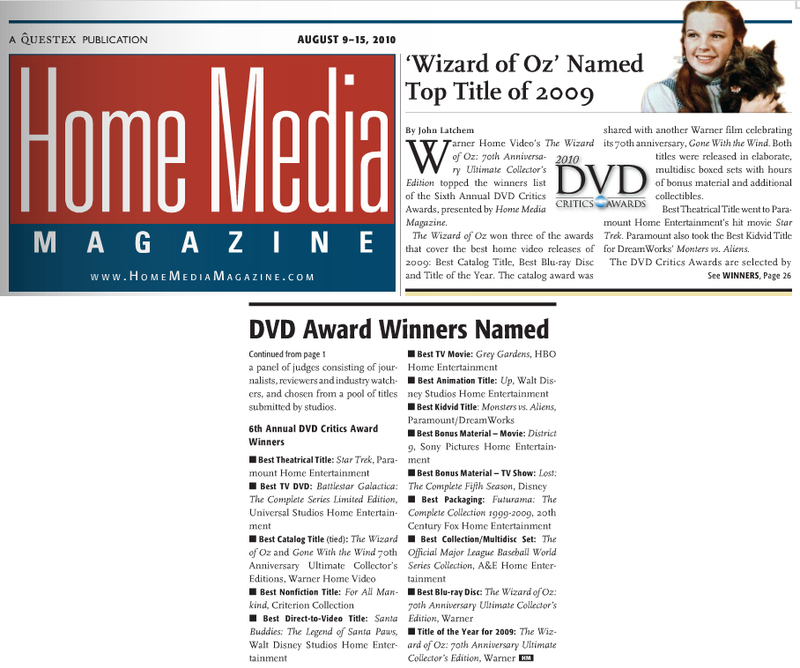 August 8, 2010: The 2009 release of the deluxe 70th-anniversary edition of The Wizard of Oz won top honors at the Sixth Annual DVD Critics Awards, presented by Home Media Magazine. Check out The Judy Room’s DVD/Blu-ray Page about the release (and all other Garland DVDs and Blu-rays) here.